The Zenmuse H3-3D 3-Axis Gimbal for GoPro HERO3/3+ from DJI is a camera stabilization device for use on select multi-rotor RC aircraft. It is driven by a 3-axis brushless gimbal that not only supports tilting and canting, like the previous H3-2D model, but also panning as well. Not only will it keep your aerial video's horizon level and isolated from vibration, the gimbal can also be used to remotely operate there camera, allowing you to adjust the camera angle with ±0.08° accuracy in flight. Box Dimensions (LxWxH) 5.5 x 5.0 x 4.3"
Zenmuse H3-3D 3-Axis Gimbal for GoPro HERO3/3+ (Standard) is rated 5.0 out of 5 by 2. Rated 5 out of 5 by Kevin Muchin from Amazing I upgraded from a 2D Tarot to the H3-3D. All my videos look amazing now compared to using a 2D gimbal. Wish I had upgraded a long time ago. Rated 5 out of 5 by Jeremy Liguori from Totally worth it I'm using this gimbal on a DJI Flamewheel F450 with the Naza M V1. Even after watching numerous videos of the footage it produces, it still blows me away every time I use it. The video is rock stable and super smooth, no matter what happens to the quadcopter it doesn't flinch. It also supports pitch control, which allows for full control of motion along with the quadcopters yaw. My transmitter only has two way switches, so I have it set to switch between straight down and about 45 degrees forward. With a knob or dial on your transmitter you could use it to smoothly pan up and down. It also seems to be more durable than I expected; I crashed it into a sand dune and the video showed what looked like a decently hard impact and lots of tumbling. The rubber seals that hold it on popped out, but it was held on by the plastic pin designed to secure it in just such a situation. Nothing broke and it all still works great. On the negative side, there is a very limited amount of documentation available from DJI, especially for anything other than the Phantom quadcopters. I spent a lot of time researching exactly how to install it, and I was lucky enough to realize that I needed the Naza PMU V2 module before I purchased it. I ended up almost completely disassembling the Flamewheel so I could get easier access to where the PMU V2 and GCU needed to be soldered on. I also had to order the mounting bracket for the Flamewheel (DJI part 51) as there is no place where the screw holes will line up anywhere on the frame. It is very tedious and time consuming to remove, (including the GoPro from the gimbal) so both the camera and gimbal have stayed on my flamewheel since I installed it. For me this is not a big deal, as I don't use my GoPro for much else. A word of warning if your testing as soon as everything is hooked up: If the GCU is not perfectly level and secure (in relation to the Flamewheel), the gimbal will often not activate and when it does it will twitch around like crazy. It took me quite a while to figure this out, before I had a means of securing the GCU. Overall, the negatives don't really affect it's performance in the field. Considering the price and that this gimbal is designed to be used with many different drone configurations, the quality of footage you get completely outweighs the negatives. it works incredibly well and I would say this is an essential accessory if you're serious about getting good aerial footage. How easy is it to hook up? As long as you are hooking it up to a Naza flight controller it is a simple hookup. It is a simple plug and play install, depending on the frame that you are installing it onto. The only item that you may need, if you have a Naza flight controller, could be a CAN HUB, that you can also get through B&amp;H. If you have the GPS and other components plugged into your flight controller you will need the CAN HUB for the extra plugs. Good luck! Will this work for other platforms like the DJI s1000 with A2 controller or only the Phantom? 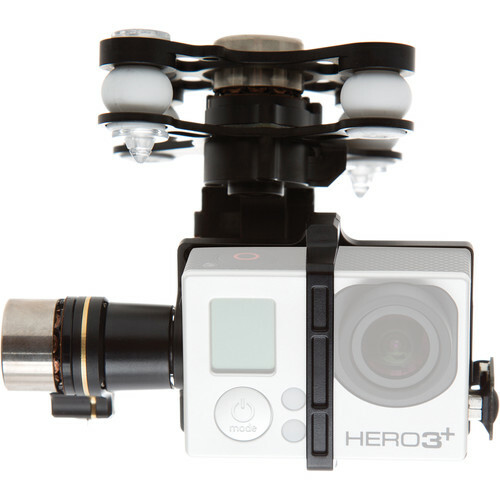 The H33D Gimbal is only to be use with DJI Phantom 2 series. how does the stabilizer handels shake on the y-axis?? The y-axis is controlled by the lever on the remote control, however it will also compensate for any movement during flight.